Ride 12.9 miles to 9,180’ gaining 5,388’ at 7.7%. Onion Valley Road is rated as the most difficult bike climb in California, #5 in the United States and #35 world.with a Fiets Index score of 14.5. This magnificent climb is located in the the heart of the Owens Valley which, with a base elevation of 4,500', surrounded by multiple 14,000' peaks is one of the deepest valleys in the U.S. The Owens Valley is a mecca for road bike climbing (PJAMM Owens Valley Climb Area Page) and boasts the greatest concentration of Top 100 Climbs than any other area in the country. Owens Valley is a graben “down dropped” block of land between 2 vertical faults which creates the unparalleled extended steep grades along its eastern border with the Sierra Nevada Mountains. Eastern Sierra Mountains - extremely steep. When to climb Onion Valley Road by bike: Well, more like when not to do the climb - we are too close to Death Valley to be doing anything in the Owens Valley in the summer (well, o.k., we have done that a lot, but do not recommend it). The average high temperatures for the summer time frame are 92 June, 98 July and 96 August. We suggest May or September as the months just before or after could put you into a snowstorm as we climb towards the top of this dead end climb that tops out just above 9,000’. How to climb Onion Valley Road by bike: Pick the right time and train well as this is the hardest climb in California at 13 miles and 7.7% average grade (¼ mile at 13.4% and ½ mile at 11.7%). Climb begins in Independence, CA at the corner of N. Webster St and Onion Valley Road (Strava Onion Valley segment start; Latitude: 36.80159, Longitude, -118.20197). We commonly stay in Bishop, California (40 miles north of Independence, CA and the start of the Onion Valley Climb) at the Creekside Inn, next to Erick Schat’s Bakery - together these two make the 40 mile trip to the climb worthwhile. As is seen from the elevation profile above, except for the first couple of miles, this climb averages nearly 8% - it is a very challenging climb. While there is at least one climb in the area that rivals Onion Valley Top U.S. 100 #7 Horseshoe Meadows - photo above, Onion Valley Road is almost uniformly considered the most difficult road bike climb in California, and rightly so. There are no provisions along this route and the temperatures during the summer will often exceed 100 degrees for the first half of the climb. Cross winds are also a factor on the descent. Access to John Muir Trail here. The John Muir Trail can be accessed from the Onion Valley Campground which is at the end of our 12.9 miles Onion Valley Road Climb. Roadway Surface and Traffic: The roadway surface in July, 2016 was good and traffic has been very light the 5 times we have climbed OVR between 2011 and 2016. The only irritation are the freeze joints in the road which are noticeable on the descent. Onion Valley Road is rated as the most difficult bike climb in California. This magnificent climb is located in the the heart of the Owens Valley which, with a base elevation of 4,500', surrounded by multiple 14,000' peaks is one of the deepest valleys in the U.S. 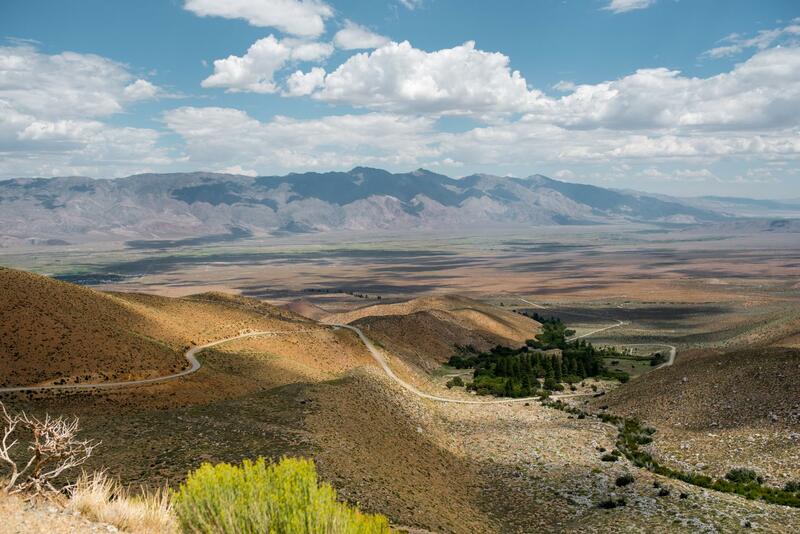 The Owens Valley is a mecca for road bike climbing and boasts the greatest concentration of Top 100 Climbs than any other area in the country. Owens Valley is a graben (“down dropped” block of land between 2 vertical faults) which creates the unparalleled extended steep grades along its eastern border with the Sierra Nevada Mountains. Other HC climbs within 50 miles of this climb are Whitney Portal, Horseshoe Meadows Rd, Glacier Lodge, Death Valley Road (West), White Mountain, Death Valley Road (East), Lake Sabrina, South Lake, Sequoia - Hwy 198 (General's Highway), and Mineral King Road. Access these other climbs by clicking "Routes in Area" on the climb card above right.